We want to offer all our guests at Garden Cottage the chance to freely enjoy the gardens during their stay. I hope that through the gardens we offer something which will make any holiday particularly special. As part of the National Gardens Scheme (NGS) the garden at Arts and Crafts house Perrycroft will officially be available for public viewing on a selection of Sundays this year. However holidaymakers staying at Garden Cottage within the grounds can enjoy access all year round. Garden Cottage Perrycroft, at Colwall near Malvern, Worcestershire invites all guests to freely enjoy the gardens at Perrycroft. 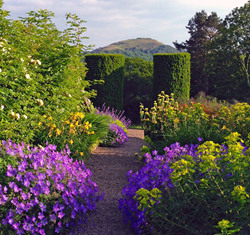 The gardens are open to visitors by appointment and on certain Sundays during the year, but guests who stay at Garden Cottage have access at any time, to enjoy the formal garden, informal walks, meadows, pond and woodland in a spectacular hillside setting. As part of the National Garden Scheme (NGS), Perrycroft will be open only on these Sundays from 2 - 5pm this year: 3rd May, 28th June and 27th September. Tea and cakes will be available, and plants propagated from the garden will be on sale. Garden Cottage, set high on the western side of the Malvern Hills, has three bedrooms with two bathrooms and accommodates up to six people. The cottage was originally the gardener’s cottage for Perrycroft, an Arts and Crafts house designed by the architect C F A Voysey in 1893. Fully restored and refurbished in 2009, the cottage has retained its historical features and details, whilst providing all the modern essentials for a comfortable family holiday. Garden Cottage provides family-friendly self-catering accommodation for holidays throughout the year. Well behaved dogs are welcome by prior arrangement. For more information about staying at Garden Cottage, please visit the website at gardencottagemalvern.